For a very quick. easy and hazzle-free deepam arrangement during karthigai festival, see the above video which is self-explanatory. A quick note again. 1. Make a semi-thick paste of chandan and kumkum and keep ready. Keep 2 ear-buds ready. 2. 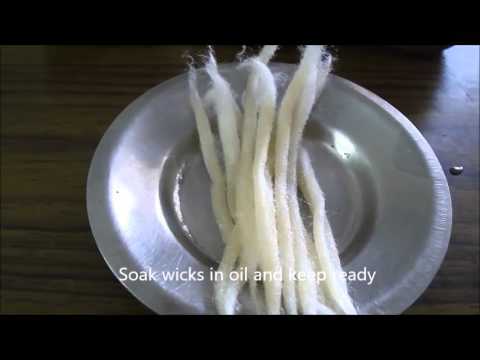 Dip the wicks in oil, squeeze lightly and keep ready. 3. Dip ear-buds in the paste and apply chandan, kumkum for the lamps. 3. Place 2 wicks in a lamp, pour little oil in each lamp. 4. Your lamps are neatly ready to be lit without any spilling. 1. Soak new earthen lamps in water for about 5 to 6 hours two days before and dry it. 2. Cut small squares from newspaper and keep under the lamps. 3. Dry roast pori to get crispier urundais. 4. Keep butter paper between each layer of pori urundais to avoid sticking to each other.